Battery cages are a housing system used for various animal production methods, but primarily for egg-laying hens. The name arises from the arrangement of rows and columns of identical cages connected together, sharing common divider walls, as in the cells of a battery. Although the term is usually applied to poultry farming, similar cage systems are used for other animals. Battery cages have generated controversy between advocates for animal rights, and industrial producers. 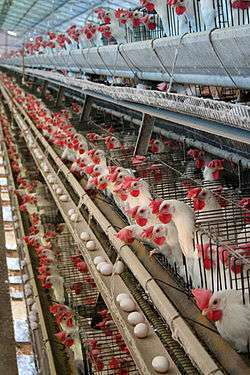 It was estimated that over 60% of the world’s eggs were produced in industrial systems, mostly using battery cages. In the US, over 90% of the 300 million egg-laying chickens are housed in battery cages. In the UK, statistics from the Department for the Environment, Food and Rural Affairs (Defra) indicate that 50% of eggs produced in the UK throughout 2010 were from cages (45% from free-range, 5% from barns). However, introduction of the European Union Council Directive 1999/74/EC which banned conventional battery cages in the EU from January 2012 for welfare reasons, means the number of eggs from battery cages in the EU states is rapidly decreasing. The EU ban was proposed when international scientists independently observed signs of extreme abnormal behaviour (including cannibalism) in caged hens. Before the cage was invented, most hens were free-range. An early reference to battery cages appears in Milton Arndt's 1931 book, Battery Brooding, where he reports that his cage flock was healthier and had higher egg production than his conventional flock. At this early date, battery cages already had the sloped floor that allowed eggs to roll to the front of the cage, where they were easily collected by the farmer and out of the hens' reach. Arndt also mentions the use of conveyor belts under the cages to remove manure, which provides better air control quality and eliminates fly breeding. Early battery cages were often used for selecting hens based on performance, since it is easy to track how many eggs each hen is laying if only one hen is placed in a cage. Later, this was combined with artificial insemination, giving a technique where each egg's parentage is known. This method is still used today. "This form of battery is coming into widespread use throughout the country and apparently is solving a number of the troubles encountered with laying hens in the regular laying house on the floor. In the first edition of this book I spoke of my experimental work with 220 pullets which were retained for one year in individual cages. At the end of this year it was found that the birds confined in the batteries outlaid considerably the same size flock in the regular houses. The birds consume less feed than those on the floor and this coupled with the increased production made them more profitable than the same number of pullets in the laying house. A number of progressive poultrymen from all over the United States and some in foreign countries cooperated with me in carrying on experimental work with this type of battery and each and every one of them were very well satisfied with the results obtained. In fact, a number of them have since placed their entire laying flocks in individual hen batteries." In 1967, Samuel Duff filed a patent for "battery cages" in patent US3465722. The use of laying batteries increased gradually, becoming the dominant method somewhat before the integration of the egg industry in the 1960s. The practice of battery cages was criticized in Ruth Harrison's landmark book Animal Machines, published in 1964. In 1990, North and Bell reported that 75% of all commercial layers in the world and 95% in the United States were kept in cages. By all accounts, a caged layer facility is more expensive to build than high-density floor confinement, but can be cheaper to operate if designed to minimize labor. 1. The handling of manure may be a problem. 2. Generally, flies become a greater nuisance. 3. The investment per pullet may be higher than in the case of floor operations. 4. There is a slightly higher percentage of blood spots in the eggs. 5. The bones are more fragile and processors often discount the fowl price. Disadvantages 1 and 2 can be eliminated by manure conveyors, but some industrial systems do not feature manure conveyors. "It is clear that because of its small size and its barrenness, the battery cage as used at present has inherent severe disadvantages for the welfare of hens". 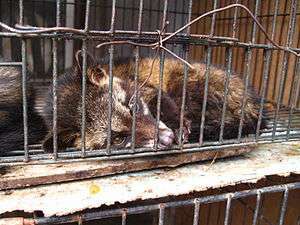 The EU Directive allows enriched or "furnished" cages to be used. Under the directive, enriched cages must be at least 45 cm high and must provide each hen with at least 750 cm² of space; 600 cm² of this must be "usable area" – the other 150 cm² is for a nest-box. The cage must also contain litter, perches and "claw-shortening devices". Some animal welfare organisations, such as Compassion in World Farming, have criticised this move, calling for enriched cages to be prohibited as they believe they provide no significant or worthwhile welfare benefits compared with conventional battery cages. 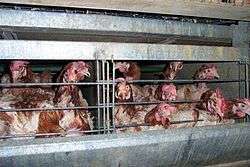 Germany banned conventional battery cages from 2007, five years earlier than required by the EU Directive, and has prohibited enriched cages from 2012. Mahi Klosterhalfen of the Albert Schweitzer Foundation has been instrumental in a strategic campaign against battery cages in Germany. Switzerland banned battery cages from January 1, 1992; it was the first country to impose such a ban. The passage of California Proposition 2 (2008) aimed, in part, to reduce or eliminate the problems associated with battery cages, by setting the standard for space relative to free movement and wingspan, rather than cage size. Finally, in Ohio, there is a moratorium on permits for the construction of new battery cages as of June 2010. 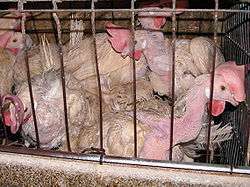 The 2009 'Code of Practice' permits the use of battery cages. A written commitment by the Federal government to review the practice was scheduled in 2010; there was no further communication. During 2013 the state government of Tasmania was planning to phase out battery cages and budgeting for financial compensation for affected farmers but this was scrapped following the 2014 election. Attempts to change the law have been an object of contention; RSPCA Australia officially campaigns against cage eggs. 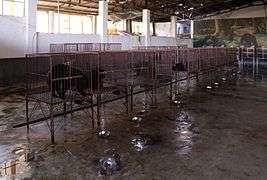 There are several welfare concerns regarding the battery cage system of housing and husbandry. These are presented below in the approximate chronological order they would influence the hens. Due to modern selective breeding, laying hen strains are different from those of meat production strains. Male birds of the laying strains do not lay eggs and are unsuitable for meat production, therefore, they are culled soon after being sexed, often on the day of hatching. 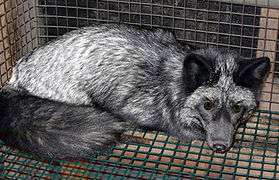 Methods of culling include cervical dislocation, asphyxiation by carbon dioxide and maceration using a high speed grinder. Animal rights groups have used videos of live chicks being placed into macerators as evidence of cruelty in the egg production industry. Maceration, together with cervical dislocation and asphyxiation by carbon dioxide, are all considered acceptable methods of euthanasia by the American Veterinary Medical Association. Consumers may also be appalled simply by the death of animals that are not subsequently eaten. To reduce the harmful effects of feather pecking, cannibalism and vent pecking, most chicks eventually going into battery cages are beak-trimmed. This is often performed on the first day after hatching, simultaneously with sexing and receiving vaccinations. Beak-trimming is a procedure considered by many scientists to cause acute pain and distress with possible chronic pain; it is practised on chicks for all types of housing systems, not only battery cages. At approximately 16 weeks of age, pullets (hens which have not yet started to lay) are placed into cages. In countries with relevant legislation, floor space for battery cages ranges upwards from 300 cm2 per bird. EU standards in 2003 called for at least 550 cm2 per hen. In the US, the current recommendation by the United Egg Producers is 67 to 86 in2 (430 to 560 cm2) per bird. The space available to each hen in a battery cage has often been described as less than the size of a sheet of A4 paper (624 cm2). Others have commented that a typical cage is about the size of a filing cabinet drawer and holds eight to 10 hens. Behavioural studies showed that when turning, hens used 540 to 1006 cm2, when stretching wings 653 to 1118 cm2, when wing flapping 860 to 1980 cm2, when feather ruffling 676 to 1604 cm2, when preening 814 to 1240 cm2, and when ground scratching 540 to 1005 cm2. A space allowance of 550 cm2 would prevent hens in battery cages from performing these behaviours without touching another hen. Animal welfare scientists have been critical of battery cages because of these space restrictions and it is widely considered that hens suffer boredom and frustration when unable to perform these behaviours. Spatial restriction can lead to a wide range of abnormal behaviours, some of which are injurious to the hens or their cagemates. To reduce the harmful effects of feather pecking, cannibalism and vent-pecking, hens in battery cages (and other housing systems) are often kept at low light intensities (e.g. less than 10 lux). Low light intensites may be associated with welfare costs to the hens as they prefer to eat in brightly lit environments and prefer brightly lit areas for active behaviour but dim (less than 10 lux) for inactive behaviour. Dimming the lights can also cause problems when the intensity is then abruptly increased temporarily to inspect the hens; this has been associated as a risk factor of increased feather pecking and the birds can become frightened resulting in panic-type ("hysteria") reactions which can increase the risk of injury. Being indoors, hens in battery cages do not see sunlight. Whilst there is no scientific evidence for this being a welfare problem, some animal advocates indicate it is a concern. Furnished cages and some other non-cage indoor systems would also prevent hens seeing natural light throughout their lives. Several studies have indicated that toward the end of the laying phase (approximately 72 weeks of age), a combination of high calcium demand for egg production and a lack of exercise can lead to osteoporosis. This can occur in all housing systems for egg laying hens, but is particularly prevalent in battery cage systems where it has sometimes been called 'cage layer osteoporosis'. Osteoporosis leads to the skeleton becoming fragile and an increased risk of bone breakage, particularly in the legs and keel bone. Fractures may occur whilst the hens are in the cage and these are usually discovered at depopulation as old, healed breaks, or they might be fresh breaks which occurred during the process of depopulation. One study showed that 24.6% of hens from battery cages had recent keel fractures whereas hens in furnished cages, barn and free-range had 3.6%, 1.2% and 1.3% respectively. However, hens from battery cages experienced fewer old breaks (17.7%) compared to hens in barn (69.1%), free-range (59.8%) and furnished cages (31.7%). Flocks are sometimes force moulted, rather than being slaughtered, to reinvigorate egg-laying. This involves complete withdrawal of food (and sometimes water) for 7 to 14 days or sufficiently long to cause a body weight loss of 25 to 35%. This stimulates the hen to lose her feathers, but also reinvigorates egg-production. Some flocks may be force moulted several times. In 2003, more than 75% of all flocks were moulted in the US. 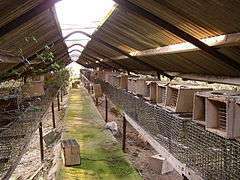 This temporary starving of the hens is seen as inhumane and is the main point of objection by critics and opponents of the practice. The alternative most often employed is to slaughter the hens instead of moulting them. The Scientific Veterinary Committee of the European Commission stated that "enriched cages and well designed non-cage systems have already been shown to have a number of welfare advantages over battery systems in their present form". Supporters of battery husbandry contend that alternative systems such as free range also have welfare problems, such as increases in cannibalism, feather pecking and vent pecking. A recent review of welfare in battery cages made the point that such welfare issues are problems of management, unlike the issues of behavioural deprivation, which are inherent in a system that keeps hens in such cramped and barren conditions. Free range egg producers can limit or eliminate injurious pecking, particularly feather pecking, through such strategies as providing environmental enrichment, feeding mash instead of pellets, keeping roosters in with the hens, and arranging nest boxes so hens are not exposed to each other's vents; similar strategies are more restricted or impossible in battery cages. ↑ "Birds on Factory Farms". American Society for the Prevention of Cruelty to Animals. Retrieved 2 March 2015. ↑ Bruce Friedrich (14 January 2013). "The Cruelest of All Factory Farm Products: Eggs From Caged Hens". Retrieved 2 March 2015. 1 2 "European Union Council Directive 1999/74/EC". Retrieved 15 November 2011. 1 2 3 4 Arndt, Milton (1931). Battery Brooding (2nd ed.). Orange Judd Publishing. pp. 308–312. ↑ United States Patent Office (1969). 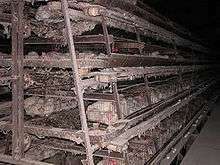 "Battery cages". Retrieved May 4, 2013. ↑ "Md. Egg Farm Accused of Cruelty". Washington Post. 2001-06-06. Retrieved 2009-07-30. 1 2 3 North, Mack O.; Donald E. Bell (1990). Commercial Chicken Production Manual (4th ed.). Van Nostrand Reinhold. pp. 297, 315. ISBN 0-87055-446-8. 1 2 Singer, Peter (2006). In Defense of Animals. Wiley-Blackwell. p. 175. ISBN 1-4051-1941-1. ↑ "Mich. Gov. Granholm Signs Historic Farm Animal Welfare Measure". October 12, 2009. Retrieved 24 February 2015. ↑ "Landmark Ohio Animal Welfare Agreement Reached Among HSUS, Ohioans for Humane Farms, Gov. Strickland, and Leading Livestock Organizations". Humane Society of the United States. 30 June 2010. Retrieved 2 March 2015. ↑ "Tas government scraps free-range egg plan". News.com.au. April 24, 2014. Retrieved 15 June 2014. ↑ "Video Shows Chicks Ground Up Alive at Egg Hatchery". The Associated Press. 2 September 2009. Retrieved 8 September 2012. ↑ Morris, M. C. (2008). "The Ethics and Politics of Animal Welfare in New Zealand: Broiler Chicken Production as a Case Study". Journal of Agricultural and Environmental Ethics. 22: 15–30. doi:10.1007/s10806-008-9128-3. ↑ United Egg Producers (2010). "Animal Husbandry Guidelines for U.S. Egg Laying Flocks" (PDF). ↑ "Animal Pragmatism: Compassion Over Killing Wants to Make the Anti-Meat Message a Little More Palatable". Washington Post. 2003-09-03. Retrieved 2009-07-30. ↑ "Advocates for Animals Turn Attention to Chickens". The New York Times. 2002-12-04. Retrieved 2009-07-30. ↑ Appleby, M.C. ; Mench, J.A. ; Hughes, B.O. (2004). Poultry Behaviour and Welfare. Wallingford and Cambridge MA: CABI Publishing. ISBN 0-85199-667-1. 1 2 Scientific Veterinary Committee of the European Commission (1996). "Report on the Welfare of Layer Hens" (PDF). 1 2 Morris, M.C. (2006). "The ethics and politics of the caged layer hen debate in New Zealand". Journal of Agricultural and Environmental Ethics. 19: 495–514. doi:10.1007/s10806-006-9007-8. Wikimedia Commons has media related to Battery cages.